Gunny ambled forward and peered down the rails into the dark. Sure enough, maybe two miles ahead, was an orange glow, and it couldn’t yet be the lights of the DeFuniak Springs station. The two men continued to stare at it as the train chugged along. It was Harvey who came to the realization first. “Good God, it’s a fire!” Harvey screamed out, and immediately he reached for the brake. 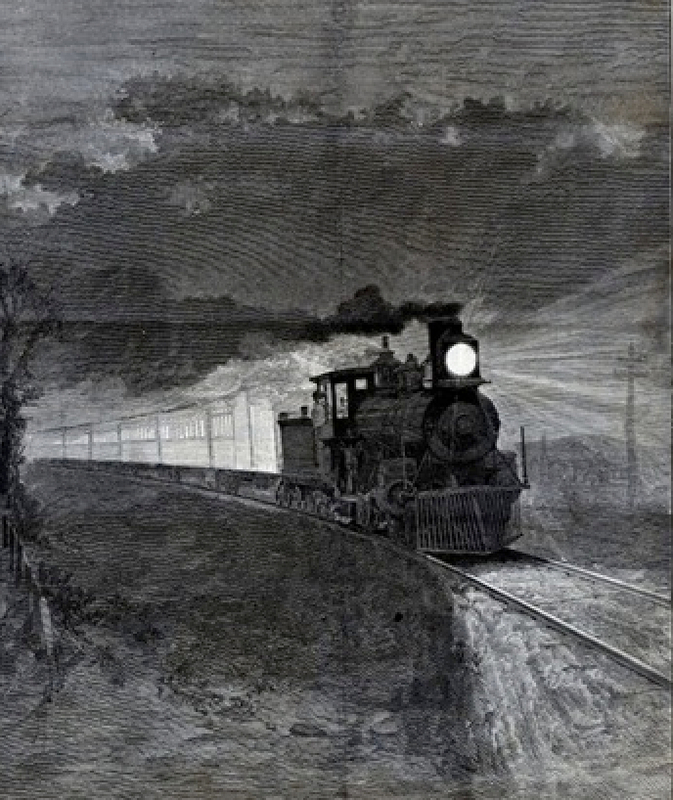 The screech of metal on metal pierced the empty woods and silver sparks rained on the rails like a thunder burst. Gunny kept his gaze on the fire ahead, not yet steadying himself, as he knew it would take half a mile to stop the thousands of pounds behind him. As the old locomotive groaned and shimmied to a slower pace, the glow ahead came into sharper focus. It was a massive bonfire, burning as high as the train’s smokestack, completely blocking the track. At last, the train rolled to a stop, its slatted cow catcher just yards from the burning log jam. Harvey and Gunny simply looked at each other, bewildered at the sight. In all their years on the railroad, never had they seen such a thing. For the sake of caution, Gunny was about to advise a back trip when Harvey yanked open the cab door to jump down and take a closer look, but both men suddenly froze. Stepping over the cab threshold and filling up the entire frame was a towering black man wielding a sawed-off shotgun. The menacing figure, a foot taller than the engineer and fireman, looked down on the men with a glower. Then, as unexpected as the fire on the tracks, he gave the toothiest of grins and spoke: “Ev’nin’, boys,” he said with a chuckle. “My name be Mow’ris. Mow’ris Slater, and I sho’ pree’shate yun’s’ co-op’ration.” With those words the big man gave a slight bow and tipped his hat to the men now being held at gunpoint.